Searcy is a community with just the right chemistry—enterprising leaders, excellent schools, superior medical care, strong churches and an exploding economy. Searcy is located at the edge of the picturesque foothills, right in the center of Arkansas' natural wonderland, and just minutes away from Greers Ferry Lake, the Little Red River, and the White River. Our community boasts four beautiful outdoor parks complete with nature trails, tennis courts, and recreation and picnic areas. The over 118 acre Searcy Sports Complex, one of the State's best, it provides 18 soccer fields, 5 basketball courts, football, baseball, and softball fields restrooms and picnic areas. The sports complex also now offers a disk golf course. Searcy also maintains 4.8 mile paved bike/walking trail that great for just a leisurely stroll or a brisk bike ride. Searcy population of just over 23,000, it's hard to believe that Searcy has over 13 major industries located right in the heart of the city. However, with a trade population of over 125,000 from Searcy and its surrounding area, it's easy to see where the city gets its strong economic base. We are also recognized as one of the finest medical communities in the nation, Searcy is home to over 75 physicians and surgeons with two state-of-the-art regional hospitals located on each end of town. One of Searcy's main attributes is the opportunity for an exceptional education. Searcy Public Schools are in the top ten percent of all schools in the state. Searcy also includes several private schools and universities. Including Harding Academy, a private Christian K-12 school, Harding University, a Christian four-year liberal arts university, and ASU Searcy. 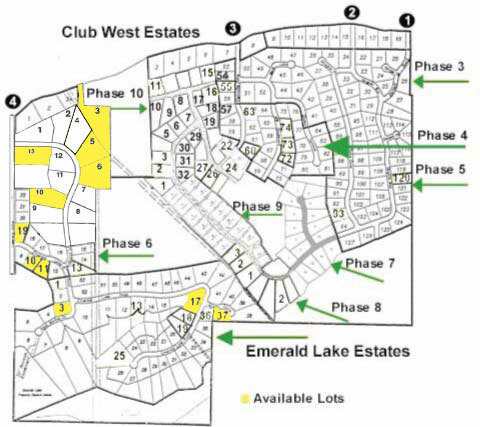 Club West Estates and Emerald Lake Estates are the premier real estate development in the Searcy, White County, and the North Central Arkansas area. Whether you are a young couple just getting started, a family who needs room to grow and a great family atmosphere, or a mature couple ready to enjoy your golden years, Club West Estates is ideal for your next home. Club West Estates has it all. With one look you will realize why so many call Club West and Emerald Lake Estates home. With winding tree lined roads, and large tree shaded lots, residents enjoy the conveniences of town and the peacefulness of the country life. We offer a community feel, connected, but not crowded. A place you can call home. Live the good live, it’s not a slogan, It is a way of life.